If you had an important court date scheduled – one that would determine your financial future, or even your very life – you’d be sure to prepare for weeks beforehand. On Rosh Hashanah, each individual is judged on the merit of his deeds. Whether he will live out the year or not. Whether he will have financial success or ruin. Whether he will be healthy or ill. All of these are determined on Rosh Hashanah. Elul – the month preceding Rosh Hashanah – begins a period of intensive introspection, of clarifying life’s goals, and of coming closer to God. It is a time for realizing purpose in life – rather than perfunctorily going through the motions of living by amassing money and seeking gratification. It is a time when we step back and look at ourselves critically and honestly, as Jews have from time immemorial, with the intention of improving. The four Hebrew letters of the word Elul (aleph-lamed-vav-lamed) are the first letters of the four words Ani l’dodi v’dodi lee – “I am to my Beloved and my Beloved is to me” (Song of Songs 6:3). These words sum up the relationship between God and His people. In other words, the month preceding Rosh Hashanah is a time when God reaches out to us, in an effort to create a more spiritually-inspiring atmosphere, one that stimulates teshuva. After the sin of the Golden Calf, Moses asked God to explain His system for relating with the world. God’s answer, known as the “13 Attributes of Mercy,” forms the essence of the “Slichot” prayers. The “13 Attributes” speak of “God’s patience.” The same God Who created us with a clean slate and a world of opportunity, gives us another opportunity if we’ve misused the first one. Finally, the most important aspect of Elul is to make a plan for your life. Because when the Big Day comes, and each individual stands before the Almighty to ask for another year, we’ll want to know what we’re asking for! 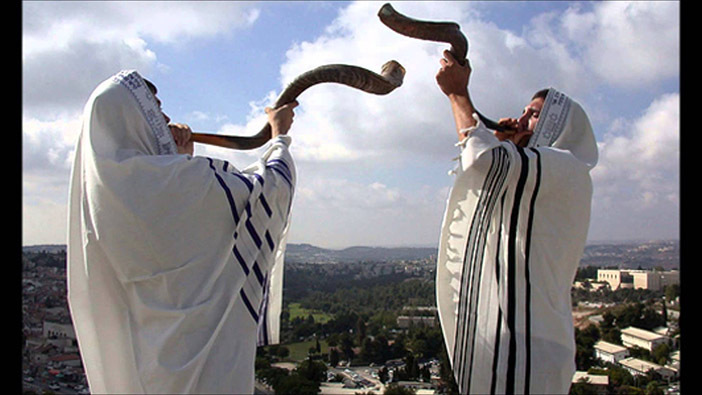 Beginning the second day of Rosh Chodesh Elul, it is the Ashkenazi custom to blow the shofar every morning after prayers, in order to awaken us for the coming Day of Judgement. The shofar’s wailing sound inspires us to use the opportunity of Elul to its fullest. Also beginning in Elul, we say Psalm 27 in the morning and evening services. (Sefardim say it in the morning and afternoon services.) In this Psalm, King David exclaims: “One thing I ask… is to dwell in the house of God all the days of my life.” we focus on the unifying force of God in our lives, and strive to increase our connection to the infinite transcendent dimension. Rewind 3,000 years to the Sinai Desert. God has spoken the Ten Commandments, and the Jews have built the Golden Calf. Moses desperately pleads with God to spare the nation. On the first day of Elul, Moses ascends Mount Sinai, and 40 days later – on the seminal Yom Kippur – he returned to the people, with a new, second set of stone tablets in hand. For us as well, the month of Elul begins a 40-day period that culminates in the year’s holiest day, Yom Kippur. Why 40? Forty is a number of cleansing and purification. Noah’s Flood rains lasted 40 days, and the mikveh – the ritual purification bath – contains 40 measures of water. Elul is an enormous opportunity. During this time, many people increase their study of Torah and performance of good deeds. And many also do a daily cheshbon – an accounting of spiritual profit and loss.